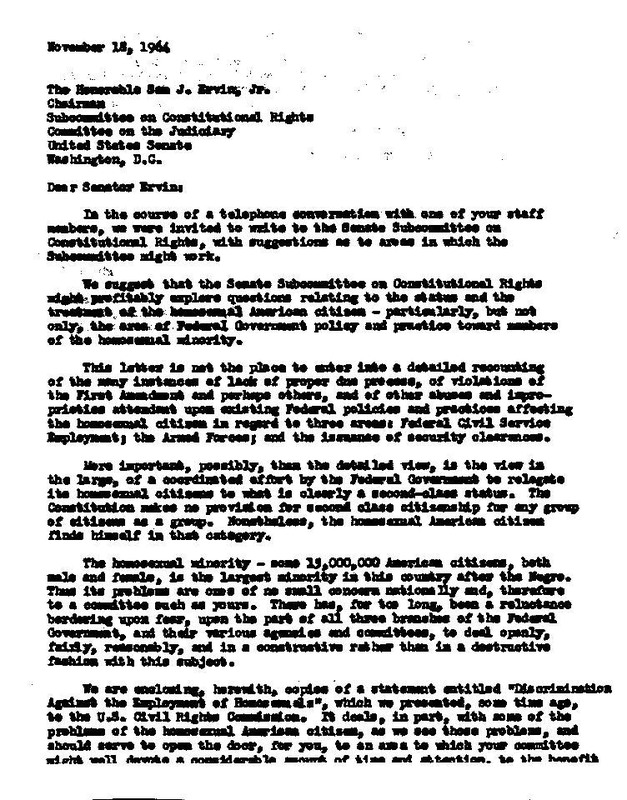 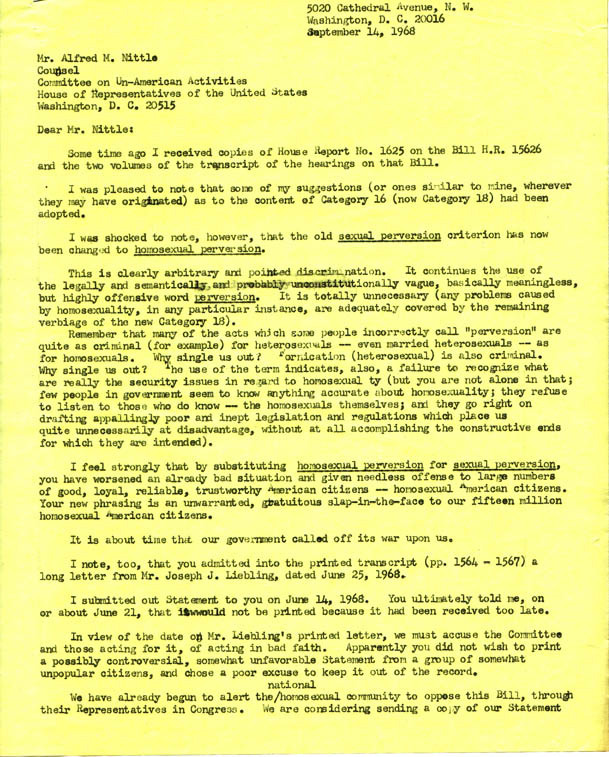 Letter to Senator Sam J. Ervin, Chairman, U.S. Senate Subcomitte on Constitutional Rights, Committee on the Judiciary, dated November 18, 1966. 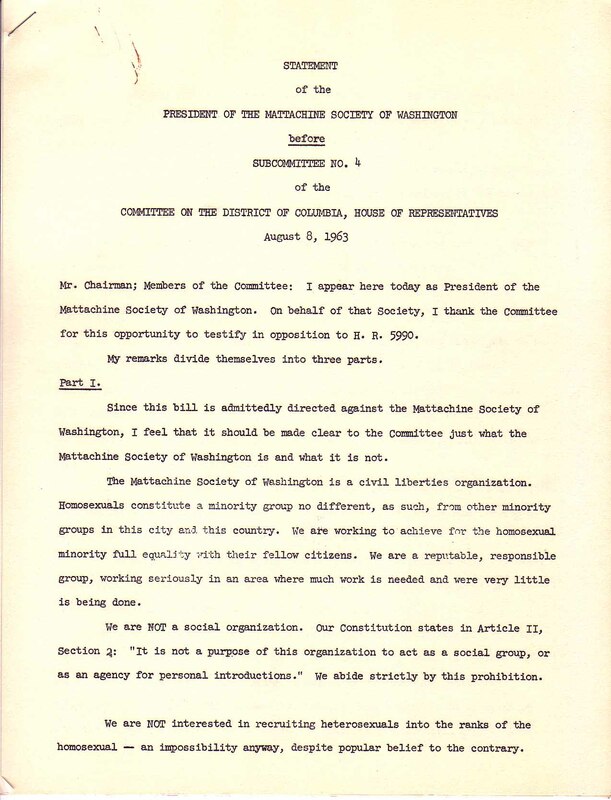 Dr. Kameny is invited to testify before the House Committee on the District of Columbia on the Dowdy Bill which would outlaw the Mattachine Society, August 5, 1963. 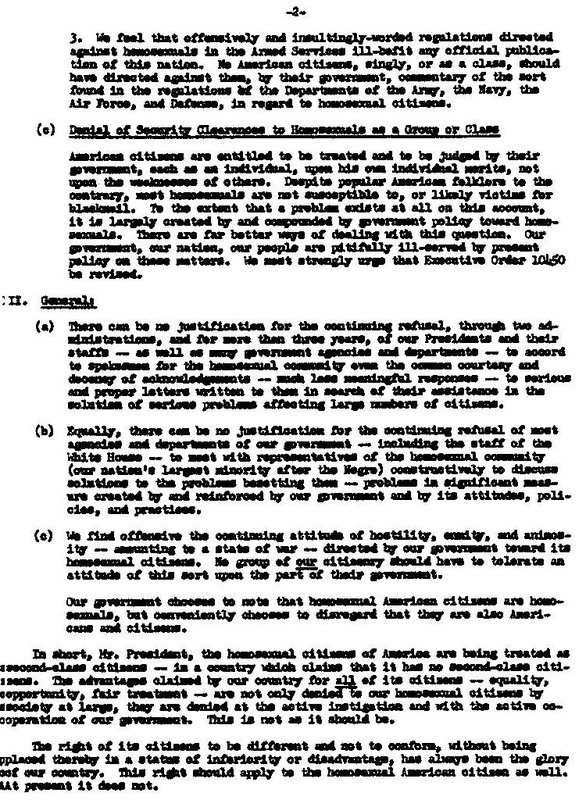 Page One of Dr. Kameny's testimony before the House Committee, opposing the Dowdy Bill, August 8,1963. 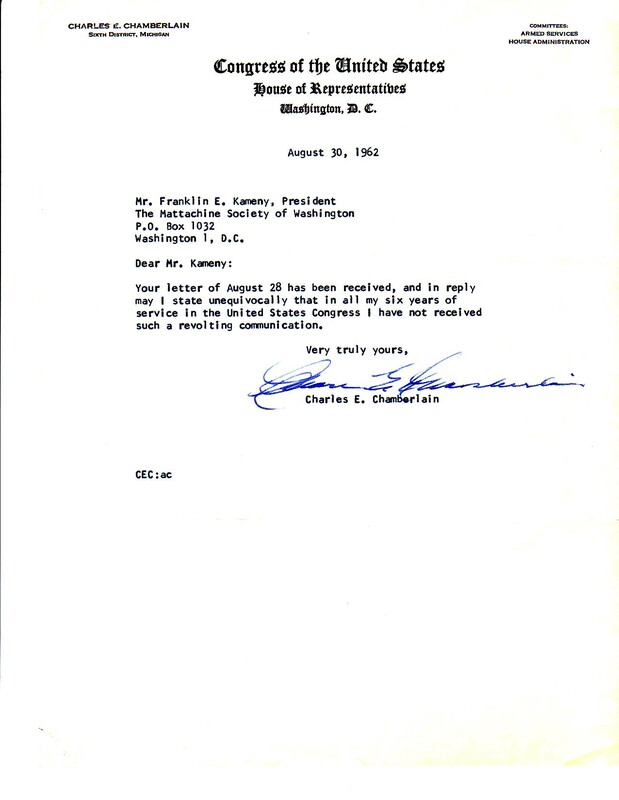 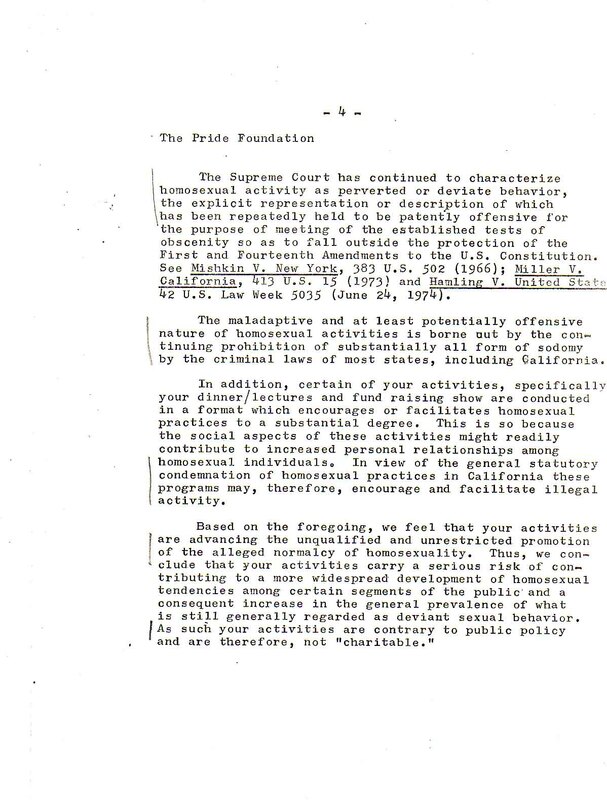 Letter from the American Psychological Association to Frank Kameny and the Mattachine Society, dated July 17,1963. 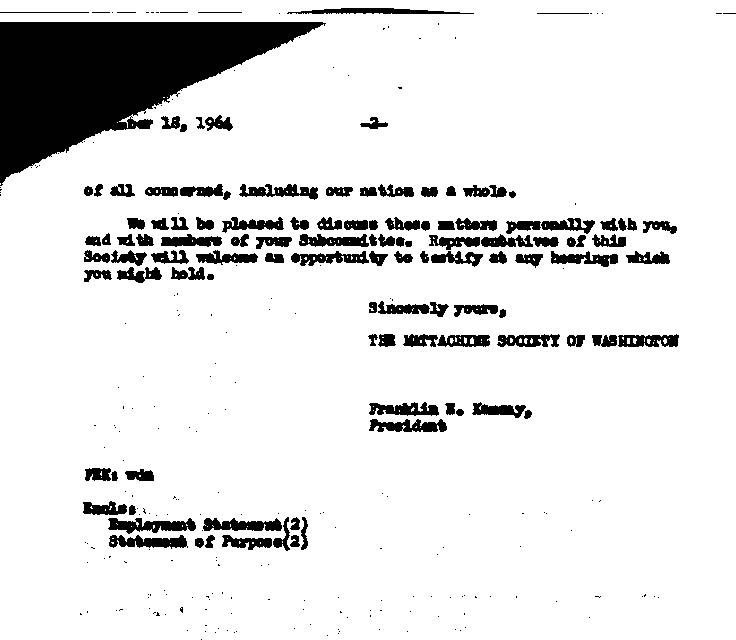 "it is not in the best interests of the APA to meet with you, nor to pulicize your meetings". 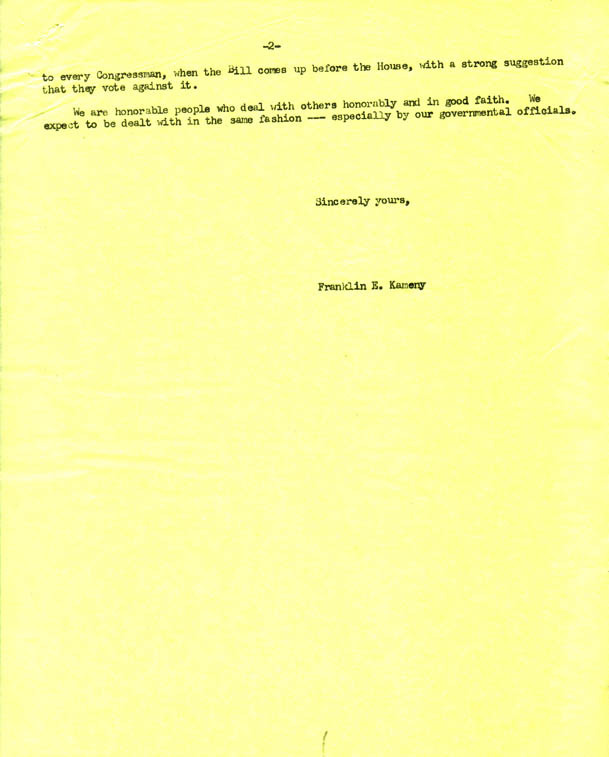 "An adversary situation has developed..."
"The Library of Congress has recieved a report concerning you..."
Letter from John Will, Director of Personnel, U.S. Department of Commerce, to Dr. Kameny, dated 11/8/71. 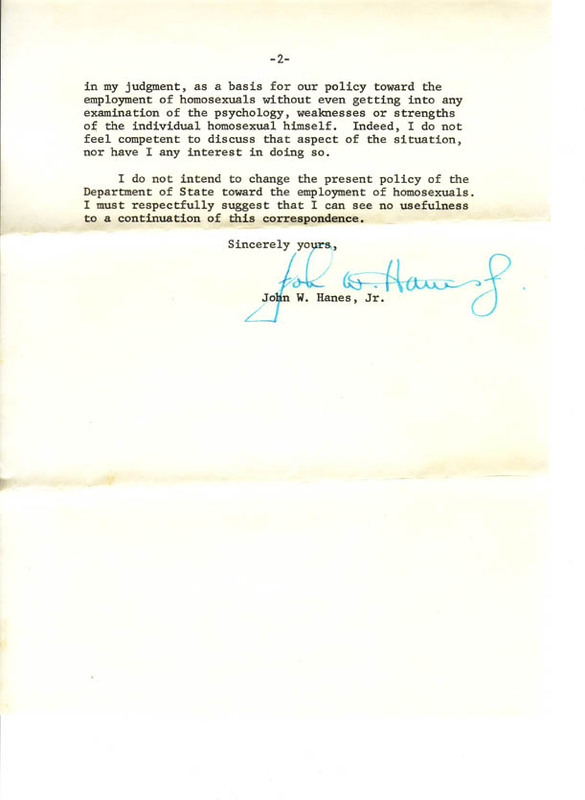 "Neither the Federal Executive Orders on fair employment nor the Civil Rights Act which constitute the authority for the program on non-discrimination are relevant to the problems of homosexuals." 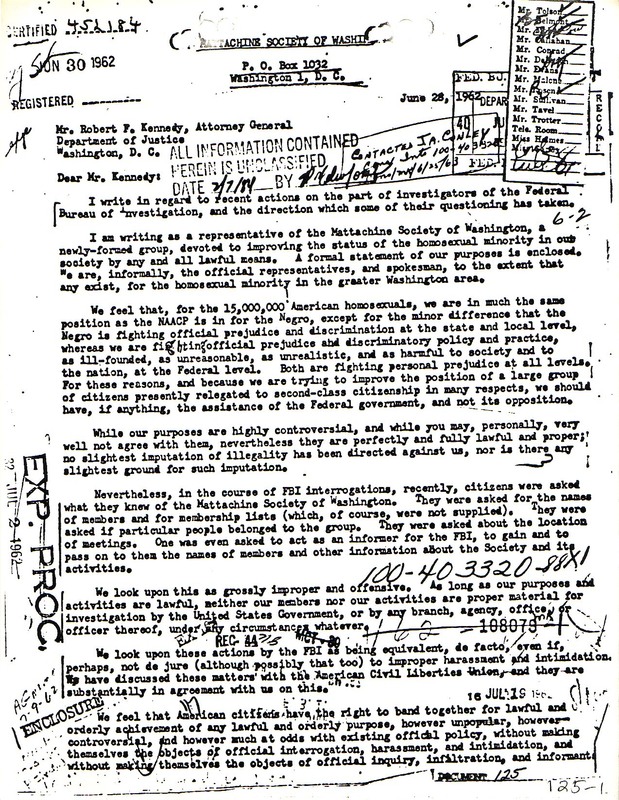 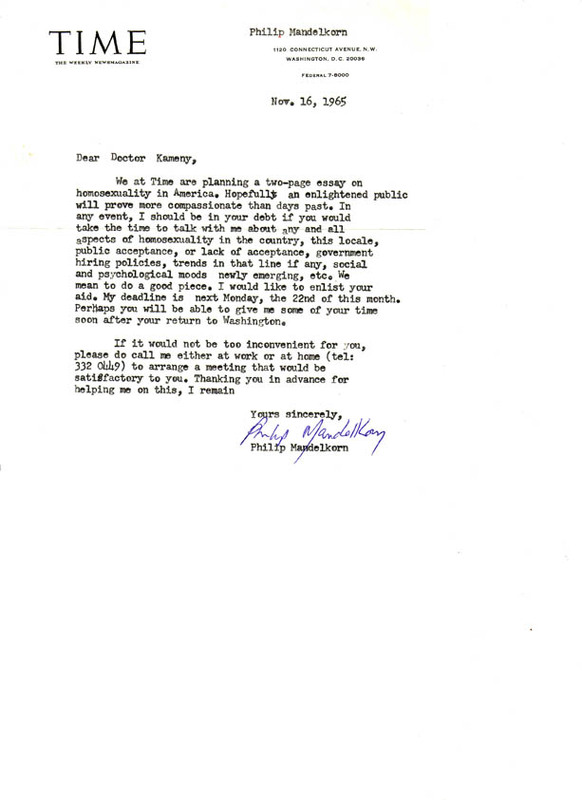 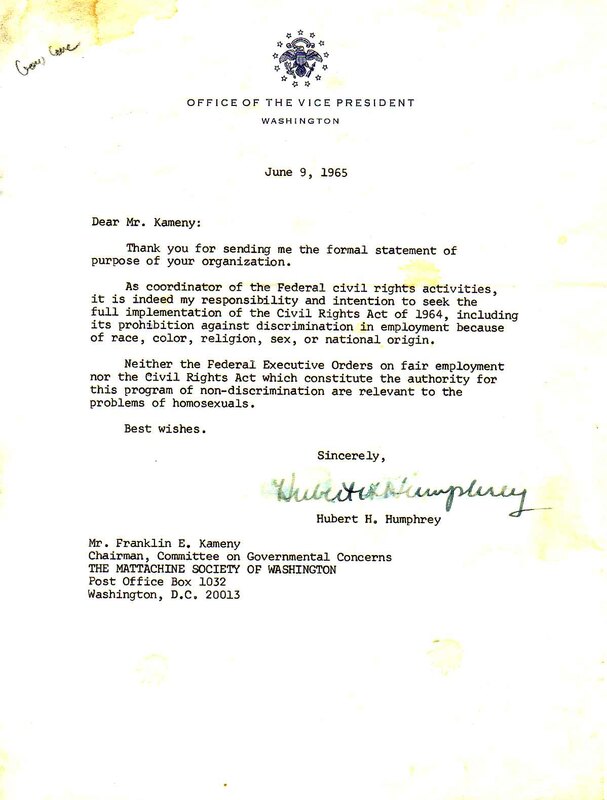 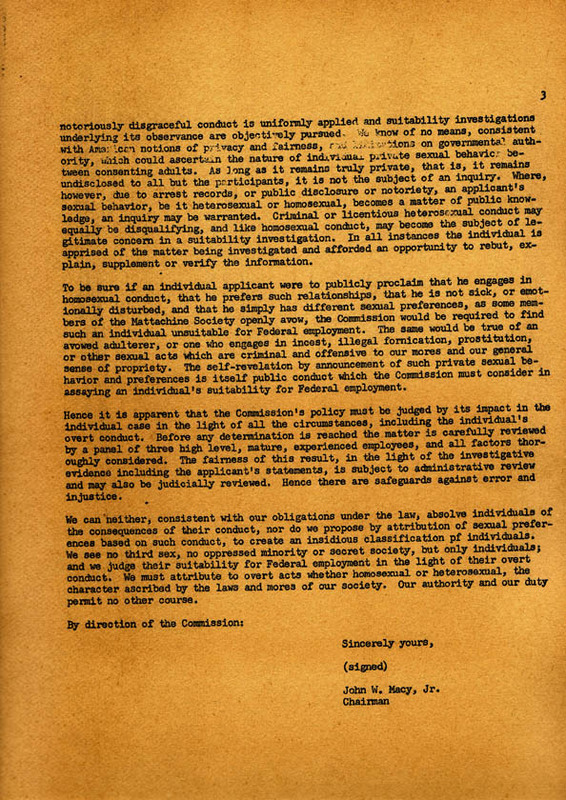 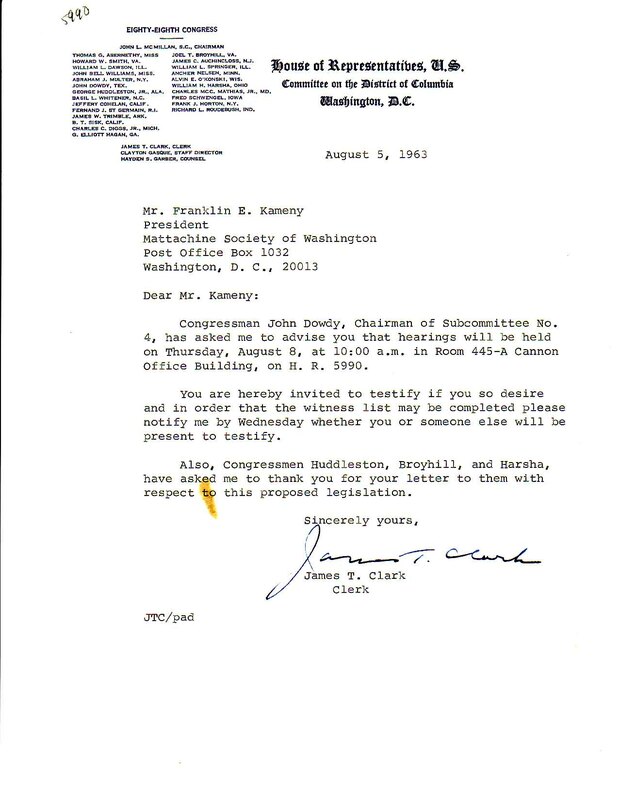 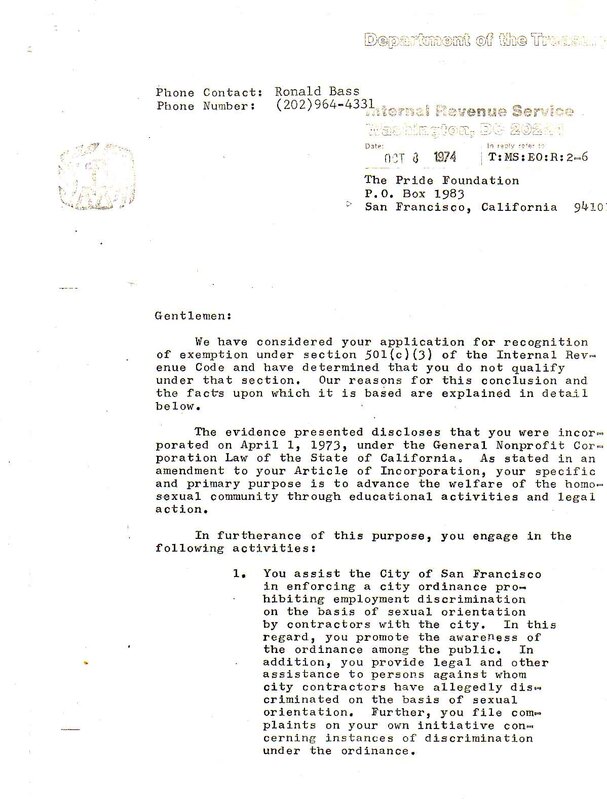 Letter from Dr. Kameny to Attorney General Robert F. Kennedy, dated June 28, 1962, asking the FBI to "halt immediately" investigation, infiltration, and interrogations of members of the Mattachine Society. 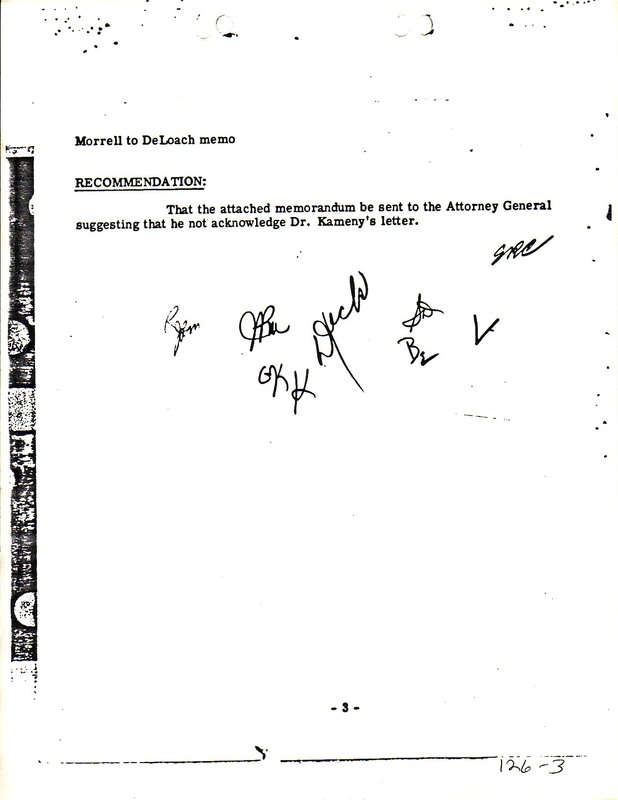 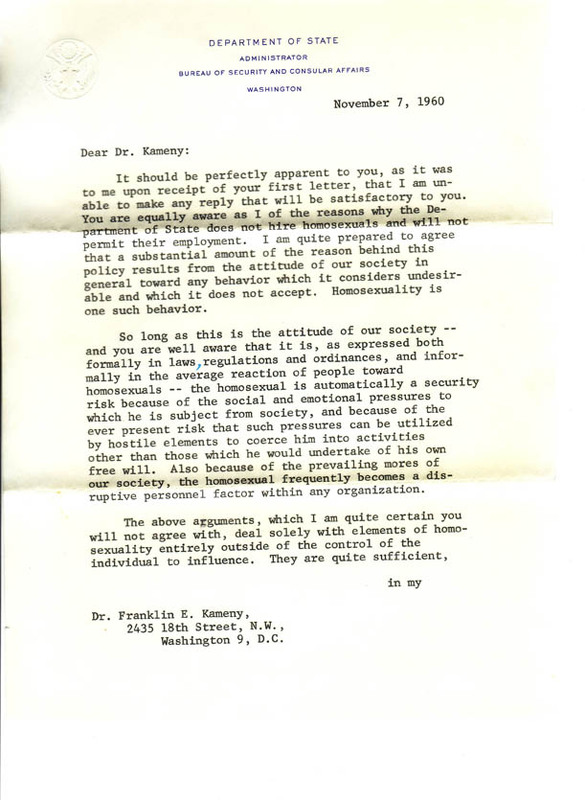 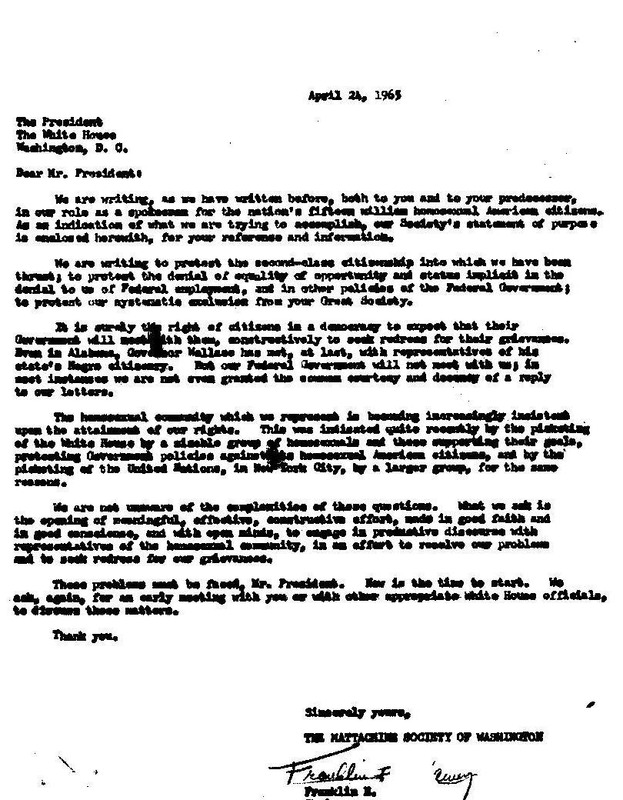 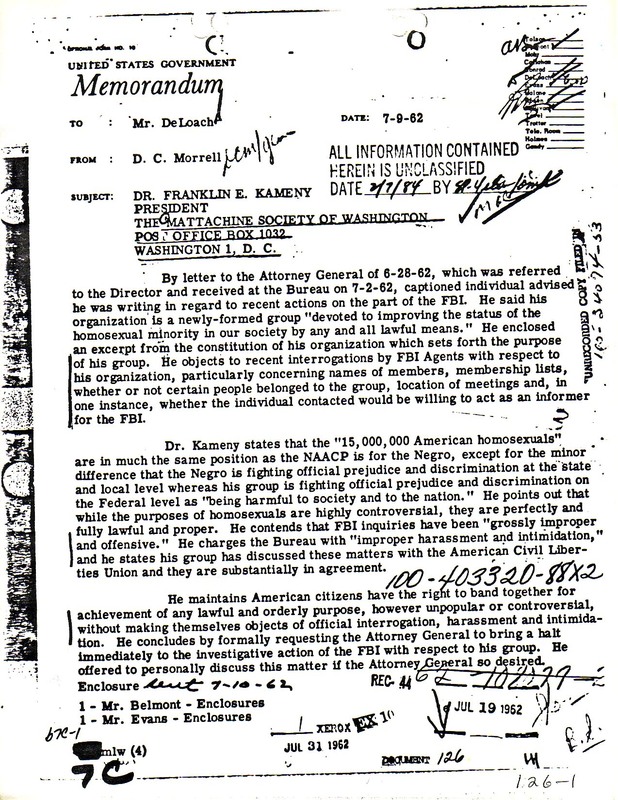 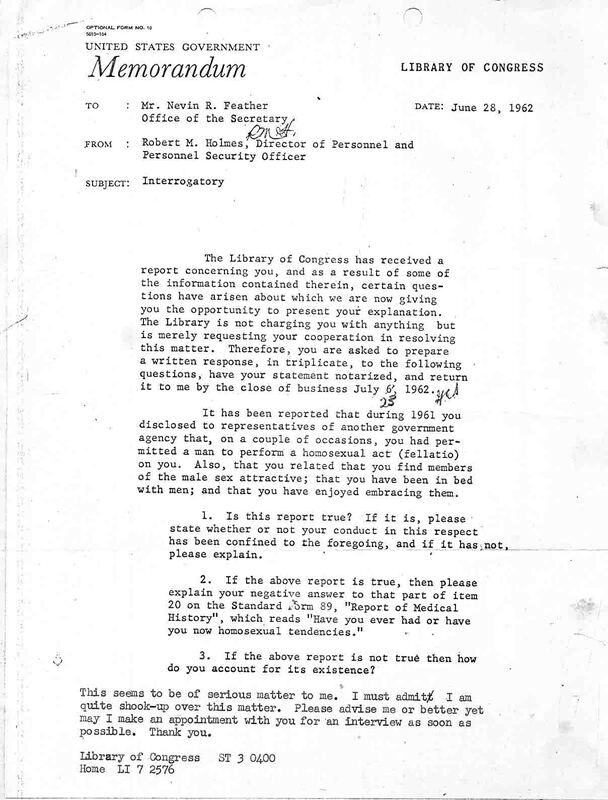 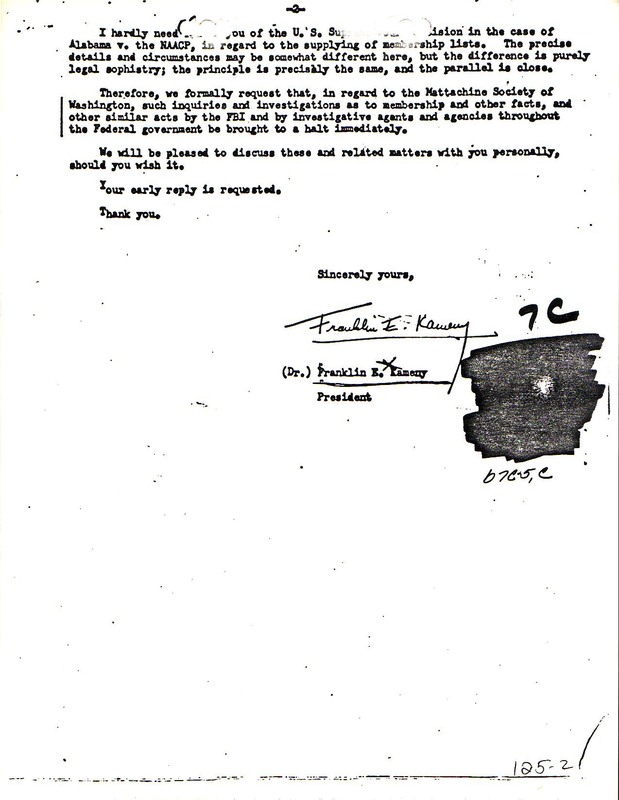 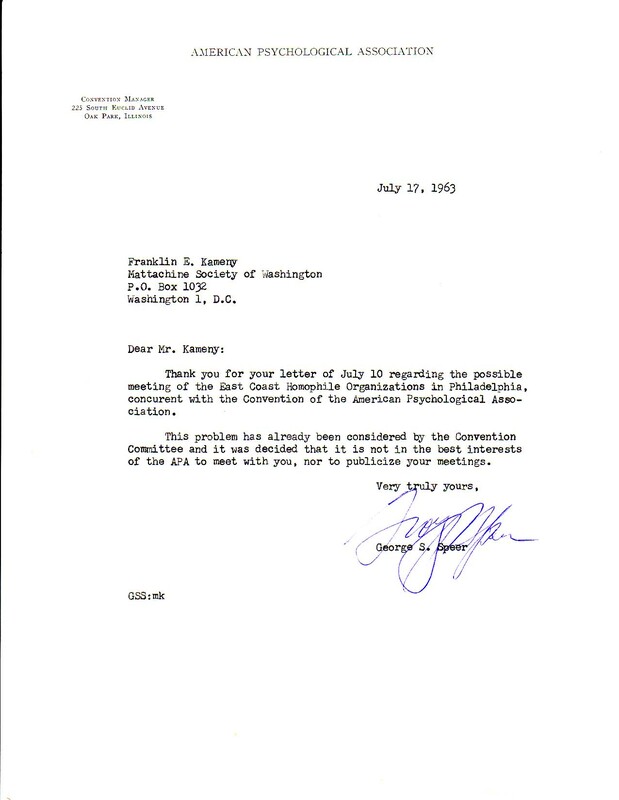 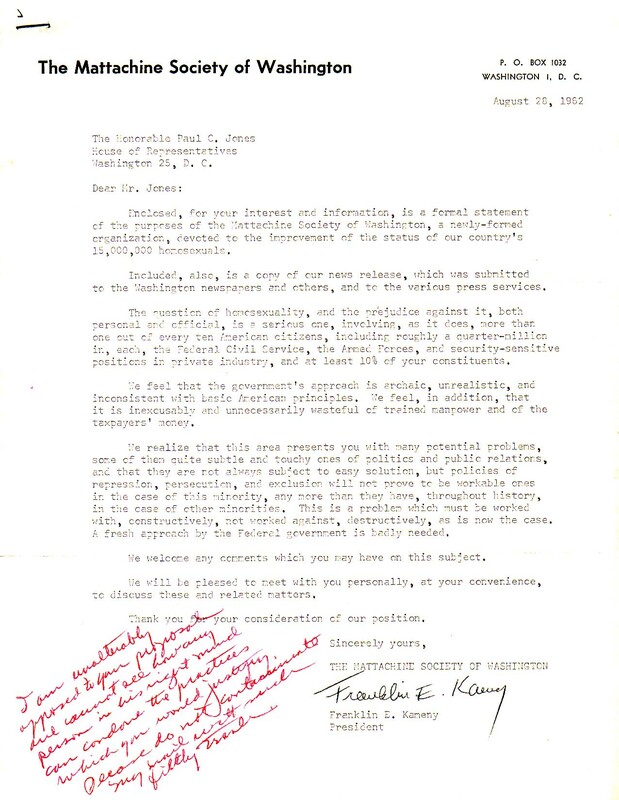 Response to the above letter to Robert Kennedy, from the Federal Bureau of Investigation dated July 9, 1962, advising the Attorney General not to respond to Dr. Kameny. 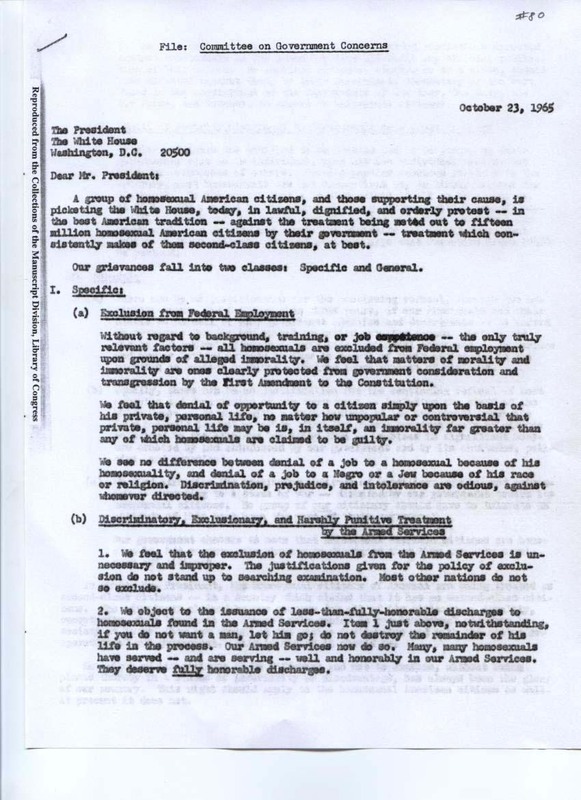 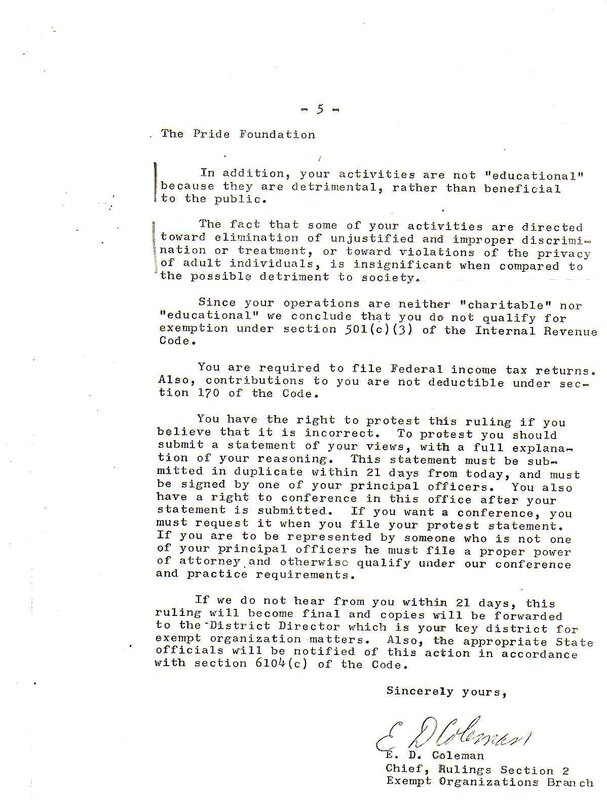 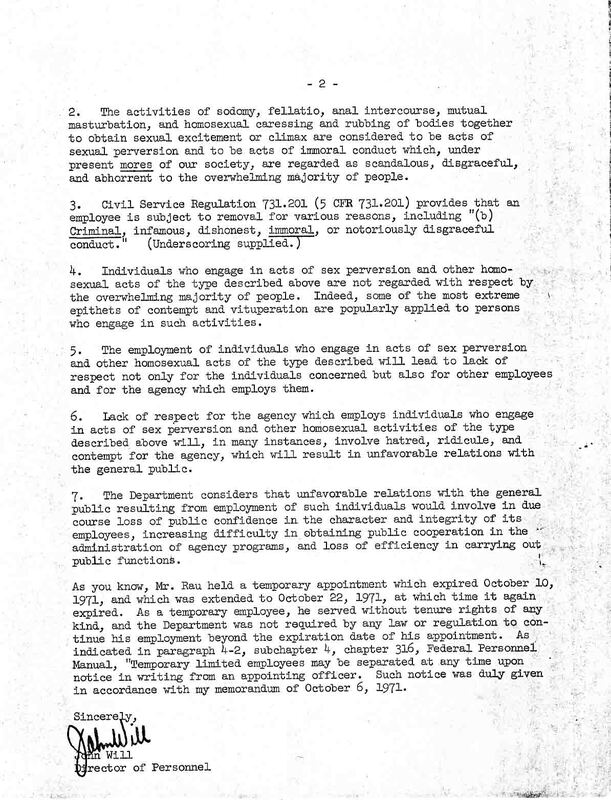 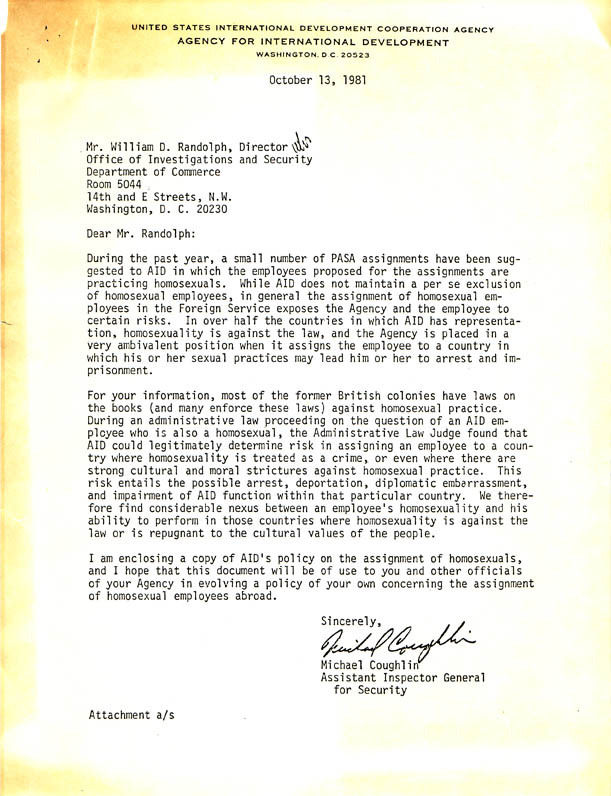 Letter from U.S. Agency for International Development (AID), dated 10/13/81, restricting "assignment of homosexuals". 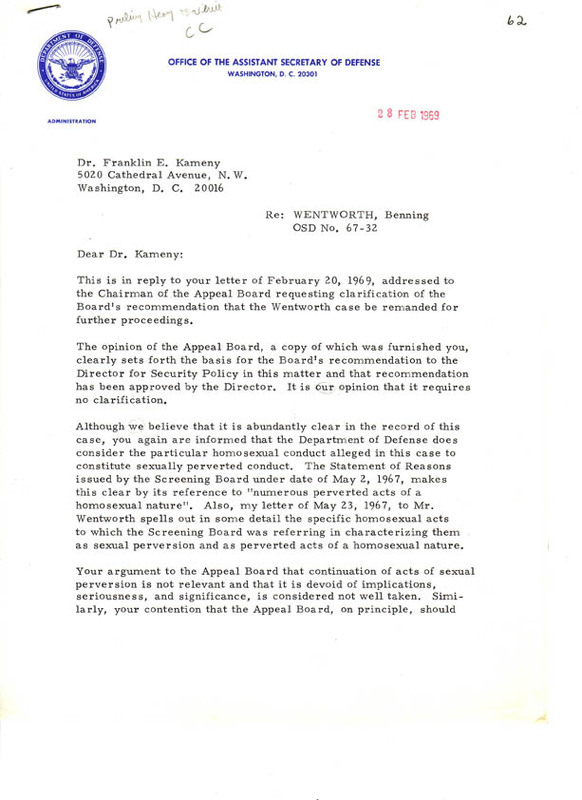 Benning Wentworth was one high profile case among many, represented by Dr. Kameny. 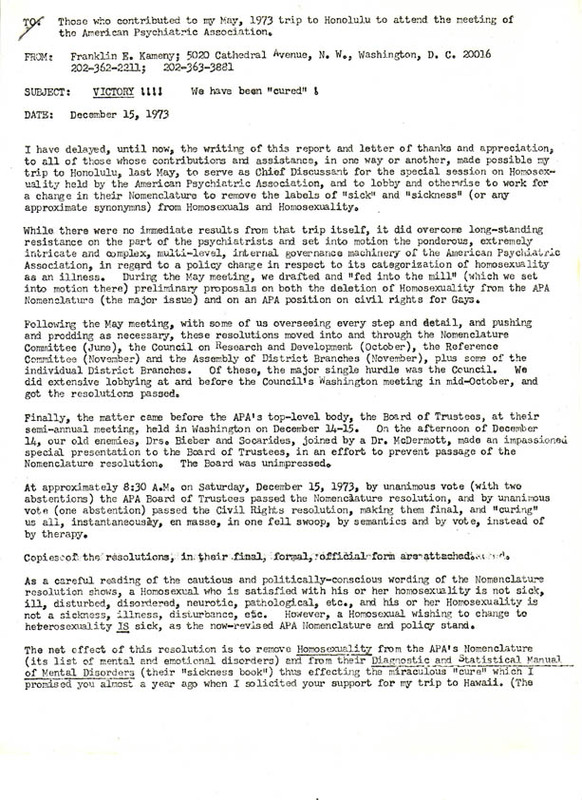 Memorandum: “Victory!!!! 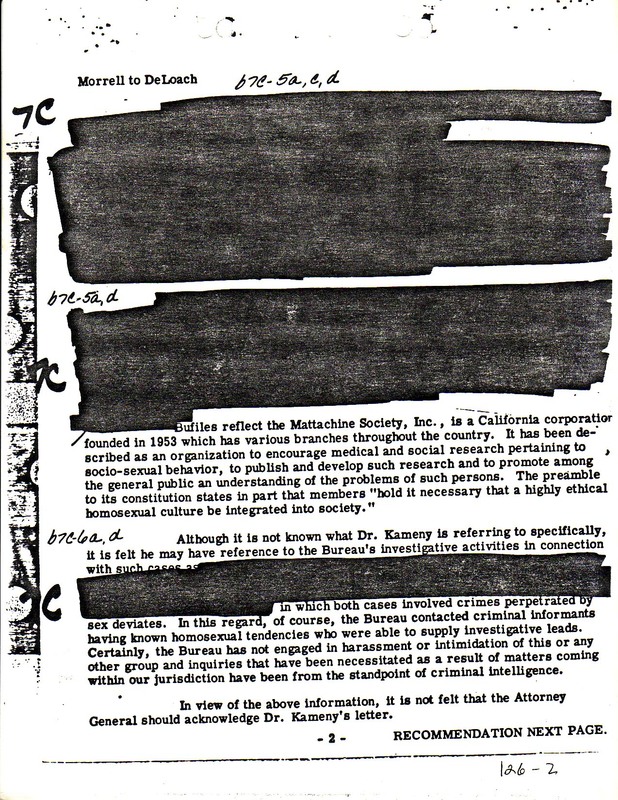 We have been “cured” , regarding the American Psychiatric Association meeting in Honolulu . 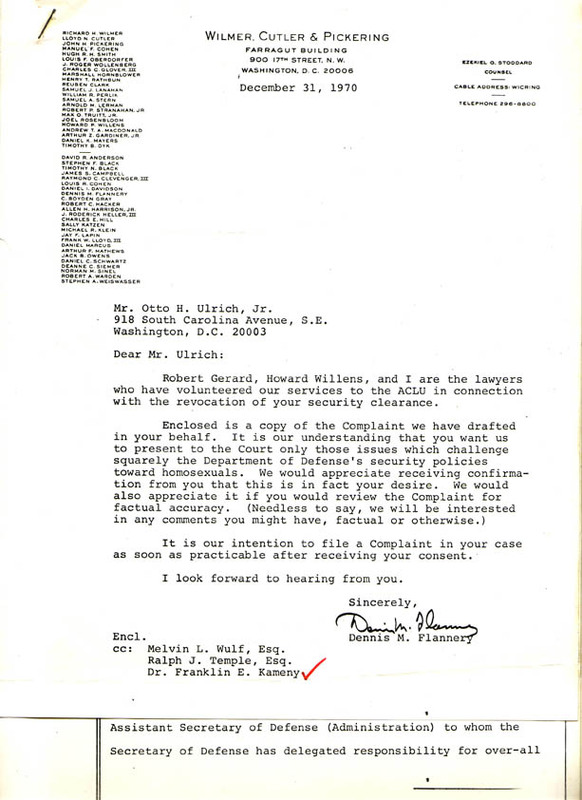 Letter from Dennis M. Flannery, Wilmer,Cutler Pickering, 12/31/70. 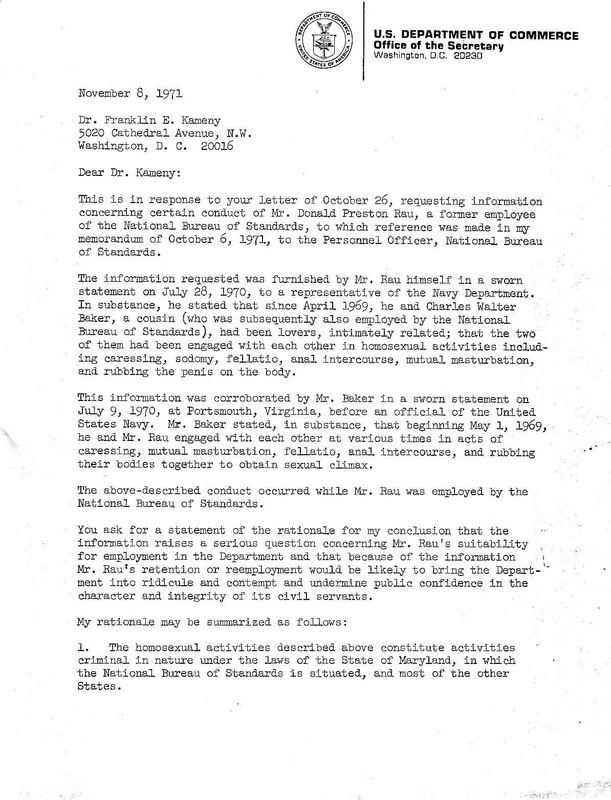 In denfense of Otto Ulrich, Jr. before Department of Defense; Kameny representing Ulrich in famous case. 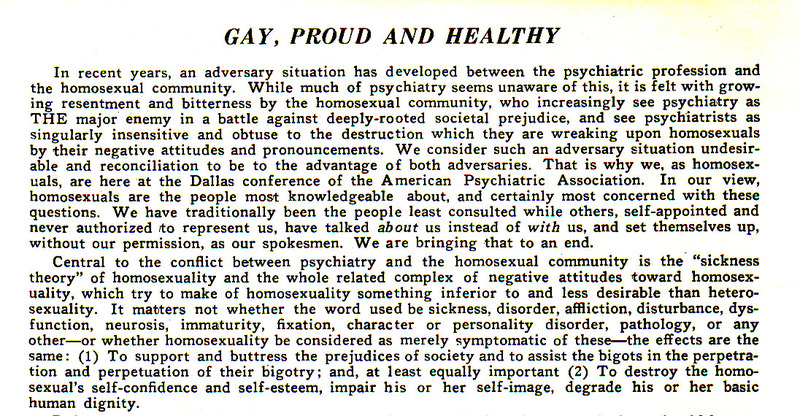 Correspondence, TIME Magazine, 11/16/65, regarding “social and psychological moods newly emerging”.